Info Edolphus "Ed" Towns Towns is currently serving his tenth term in the U.S House of Representatives. He represents the tenth Congressional District of Brooklyn, New York, encompassing the neighborhoods of East New York, Canarsie, Brownsville, Bedford-Stuyvesant, Cypress Hills, Clinton Hill, Mill Basin, Brooklyn Heights, downtown Brooklyn, Boreum Hill, Cobble Hill, Carroll Gardens, as well as parts of Fort Greene and Williamsburg. Representative Towns is a member of the exclusive Energy and Commerce Committee where he is the ranking member on the Subcommittee on Commerce, Trade, and Consumer Protection. This committee has jurisdiction over Internet privacy, the federal trade commission and the consumer products safety commission, among many other issues. Representative Towns also serves on the Health Subcommittee, the Environment and Hazardous Materials Subcommittee as well as the Government Reform Committee's Subcommittee On Energy Policy, Natural Resources and Regulatory Affairs. Throughout his tenure in Congress, Rep. Towns has been actively involved in promoting legislation in education, telecommunications, healthcare, financial services and the environment. Some of his legislative successes include: the "Student Right to Know Act", a law to mandate the reporting of student athletes graduation rates; new bilingual education programs for the gifted and talented, teacher training and special education; enhanced Medicare reimbursement rates for mid-level practitioners; successfully maintained mammography screening at age 40; established a Federal-funding base for poison control centers; initiated new standards for the inclusion of children in clinical trials; created the Telecommunications Development Fund to provide capital for small and minority telecommunications businesses; and during the modernization of financial services debate, successfully fought to protect the interests of New York's financial services industry. The Congressman has also received numerous awards for his legislative work, particularly in the area of health care. He was twice designated "Legislator of the Year" by the American Association of Community Health Centers. The National Association of Rural Health Clinics credited him for his work in successfully opposing budget reductions to their program. The Greater New York Hospital Association recognized him for his efforts in protecting New York City hospitals against Federal budget cuts. The National Academy of Nurse Practitioners, The American Academy of Physician Assistants, and the American College of Nurse-Midwives all have awarded him recognition as their "Legislator of the Year" for his efforts to increase access to mid-level clinicians. Additionally, The National Association for Home Care named him a "Home Care Hero". And, education organizations like the National Education Association and the American Association of University Women have consistently given the Congressman 100% ratings. Rep. Towns has also brought important economic development projects to the 10th Congressional District: returned a Jobs Corps Center to Brooklyn; acquired $3 million for the revitalization of the Fulton Street Development project; secured a $3 million planning grant for a proposed Bedford-Stuyvesant, downtown Brooklyn, and Williamsburg empowerment zone; successfully obtained $153 million for a new federal courthouse in downtown Brooklyn; chaired the task force that reactivated the Gowanus Canal Flushing Tunnel which had been inactive for 30 years; secured $18 million for conducting a major investment study of the Gowanus Expressway and a tunnel alternative. Moreover, he has secured several million dollars in education grants that have gone to the New York Technical College, Polytechnic University, and Long Island University. He also successfully led the fight to restore the accounts of Freedom National Bank's Depositors and obtained a $150 million reconstruction bond for Interfaith Hospital. In the environmental area, Rep.Towns sponsored the Democratic brownfields' initiative in the 106th Congress and will once again take a lead role in the effort to restore urban areas that could otherwise provide business opportunities and jobs to the 10th congressional district. Also, Rep. Towns continues to support efforts to create open space throughout Brooklyn, including the Brooklyn Bridge Park project of which he was an original incorporator. In addition, the National Audubon Society recognized the Congressman for his leadership in securing federal funds for restoration activities in Prospect Park. Representative Towns had the distinction of being the first African American to serve as Deputy Brooklyn Borough President. He and his son, NYS Assemblyman Darryl Towns, achieved a political legacy when they became the first African American father/son tandem to serve simultaneously in public office in New York State. Rep. Towns' varied professional background includes assignments as an administrator at Beth Israel Medical Center, a professor at New York's Medgar Evers College and Fordham University and a teacher in the New York City Public School System. He is also a veteran of the United States Army and an ordained Baptist minister. The Congressman has a master's degree in social work from Adelphi University and a bachelor's degree from North Carolina A & T State University. He has also received honorary doctorate degrees from Adelphi University, Long Island University, College of Pharmacy, New York College of Podiatric Medicine, North Carolina A& T State University, Shaw University and Virginia Seminary. 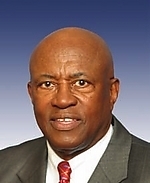 Congressman Towns was born in Chadbourn, North Carolina. He is married to the former Gwendolyn Forbes and they reside in the Cypress Hills section of Brooklyn. They have two children, Darryl and Deidra, and three grandchildren, Kiara, Jasmine, and Kristian. The Congressman also serves as a surrogate father to his nephews Jason and Jereme Towns.